The standardized herbal extracts contained in GLUCEMEDIN® help break down lipids, manage body weight in overweight patients and prevent the build-up of cholesterol on the inner walls of blood vessels, lower the risk of vascular deposits. Gymnema contains a number of active substances: glycosides, gymnemic acids and gurmarin that have an effect on the glucose and lipids metabolism. It improves sensitivity to insulin, increases insulin secretion by pancreatic β-cells, inhibits the intestinal absorption of glucose and fatty acids, enhances glucose disposal by the cells, improves glucose uptake in the muscles, helps with the regeneration of the islet cells, reduces sensitivity and cravings for sweets. Banaba contains corosolic and gallic acid that significantly lower glucose and cholesterol levels. It increases sensitivity to insulin, improves cellular glucose uptake, inhibits gluconeogenesis in the liver, exerts antioxidant and anti-inflammatory effects, and helps lose excessive weight. Bitter melon is a source of saponins (charantin), glycosides, alkaloids, amino acids. It produces an insulin-like effect, improves glucose penetration into the cells, stimulates insulin production by the pancreatic β-cells and helps preserve its functions. It increases peripheral glucose uptake and disposal, improves insulin sensitivity, decreases intestinal glucose absorption, boosts the immune system, and displays anti-inflammatory and antibacterial effects. NUTRITIONAL AND ENERGY VALUE (CALORIC VALUE) FOR DAILY INTAKE (3 CAPSULES OR 900 mg): proteins – 15.0 g, carbohydrates – 1.1 g, fats – 0 g; 64.4 kcal (296 kJ). RECOMMENDATIONS FOR USE: GLUCEMEDIN® is recommended as a balanced complex of standardized herbal extracts for type II diabetes to lower blood glucose, cholesterol and triglyceride levels. 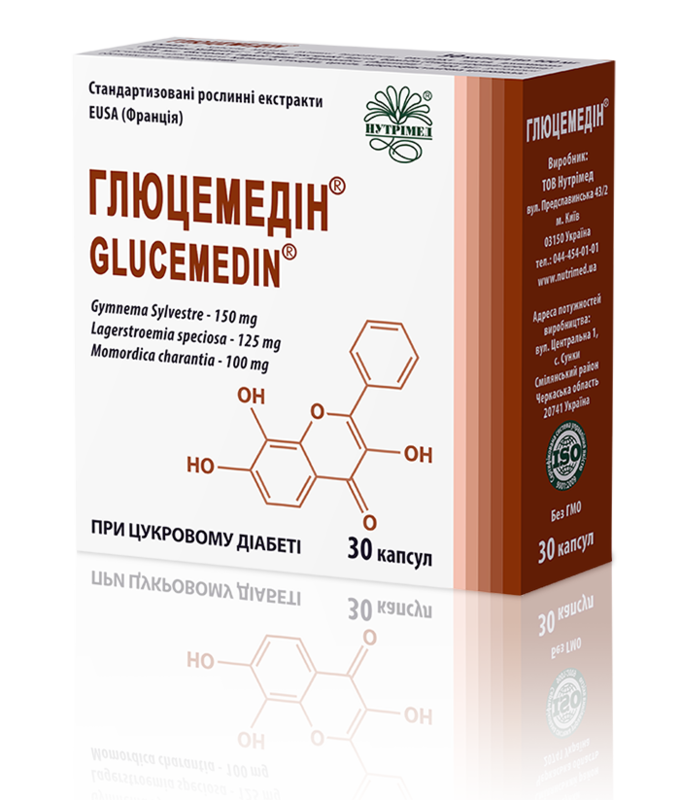 The standardized herbal extracts contained in GLUCEMEDIN® help break down lipids, manage body weight in overweight patients and prevent the build-up of cholesterol on the inner walls of blood vessels, reduce the risk of vascular complications in type I and type II diabetes , have a positive effect on the functional status of the pancreas and improve its functional activity, help improve the endocrine profile in the body and general health, normalize glucose metabolism and the regeneration of the pancreatic cells. METHOD OF ADMINISTRATION AND RECOMMENDED DAILY DOSE: adults should take 1 capsule 3 times daily before meals swallowed with plenty of drinking water. The treatment course is 2-3 months. The course can be repeated if needed. PHARMACEUTICAL FORM: capsules with the contents weight of 400 mg ± 7.5%.